Depression is a common medical condition in the elderly, but it is not a normal process of aging. 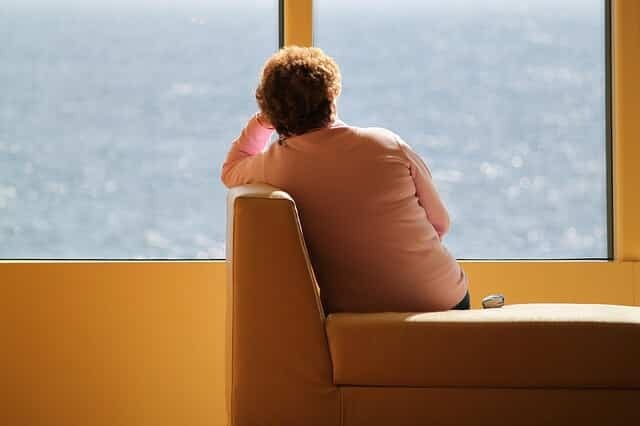 However, senior adults are at an increased risk for experiencing depression. Depression is not just having “the blues” or the emotions one feels when grieving the loss of a loved one. It is often misunderstood because of the side effects of a variety of illnesses and the medication used to treat them. If you are concerned about a loved one, offer to go with them to see a health care provider to be diagnosed and treated. As one goes through life, they experience a variety of losses. Among the elderly, the losses increase with losing mobility, health, a loved one, a career, or their independence. Grief is a roller coaster of emotions, with good and bad days. With depression, the feelings of emptiness and despair are constant and never diminish. While there’s no set timetable for grieving, if it doesn’t change over time or shows no signs of joy—laughing at a joke, positively responding to a hug, appreciating the little things—it may be depression. Depression can interfere with your loved one's capability of reaching out for help. Many seniors who experience depression struggle because they were raised in a society where mental illness was often misunderstood. If an elderly person you care about is depressed, you can make a difference by offering emotional support to them. See that your loved one gets a proper diagnosis and good treatment. Help your loved one find a good doctor, join them on their appointments, and offer emotional support. Encourage the person to follow through with treatment. Depression can often reoccur if the treatment is stopped prematurely. Help your loved one focus on their treatment plan. If it isn’t helping, look into other medications and therapies. Schedule regular social activities. Trips out of the house, visits from family and friends, and other social activities can help fight isolation and loneliness. Depressed people often feel better when they’re around others. Keep encouraging them even if they refuse to get out. Make sure all medications are taken as instructed. Help them to remember taking their medication and to take it as instructed. They should be reminded and encouraged to never mix alcohol with medication. Plan and prepare healthy meals. Depression can be influenced easily due to one not eating right. Be sure they get plenty of fruit, vegetables, protein, and whole grains at every meal. Watch for suicide warning signs. Seek immediate professional help if you suspect that your loved one is considering suicide. The National Suicide Prevention Lifeline is 1-800-273-8255. If you or a loved one are experiencing depression or grief, we encourage you to talk with a medical professional to help make the distinction. Depression is an illness. Reaching out for help is sign of strength and can help one on the road for proper treatment.